Galaxies began to form about a billion years after the birth of the Universe. At this time the Universe was filled with gas - mainly hydrogen, with some helium. Astronomers believe that the galaxy formed out of a large, fairly spherical cloud of cold gas in space. At some point in time, the cloud began to collapse in on itself, in the same way that the clouds which formed individual stars also collapsed. Some stars may have formed as the gas cloud began to break up around the edges, with each fragment collapsing even more to form a star or group of stars. These stars consisted only of the hydrogen and helium gas that made up the cloud. The cloud continued to collapse, with more and more stars forming as it did so. As the formation of new stars continued, some of the early massive stars reached the end of their lifetimes and began to throw off their atmospheres or explode in huge supernovae. In this process, the remnants of these old stars mixed with the gas in the collapsing cloud, adding the new, heavier elements that they had created. These elements were then included in the new stars as they were formed in the disc regions. These younger, enriched stars are called population 1 stars, while the older, mainly hydrogen and helium stars, are called population 2. This process of star formation, the creation of heavier elements inside stars and the final release of these elements into the gas between the stars (called the interstellar medium) still continues today. This constantly adds to the gas within our galaxy so that it now consists not only of hydrogen and helium, but also the other elements that are needed to form the Earth and the rest of the Universe we see around us. As the young clouds collapsed, they also rotated. The speed of rotation determined the type of galaxy they would form. Fast rotating clouds flattened out into a disc. Stars that were created early on formed a spherical halo around the outside of the galaxy, while those created later were concentrated in the disc. These are spiral galaxies. Clouds rotating more slowly weren’t able to form a disc, and so the gas continued to fall to the centre in a spherical shape. Star formation continued throughout the entire galaxy and formed the elliptical galaxies. Irregular galaxies usually form due to collisions between other types of galaxy. 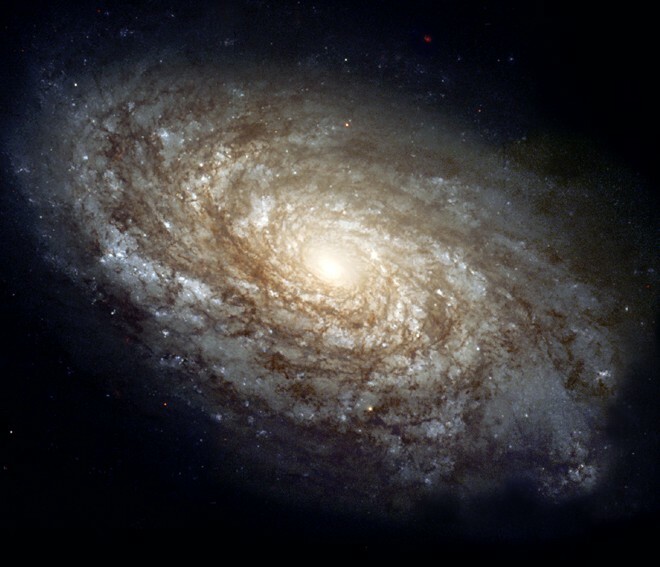 Click on the links below to find out more about galaxies.